Preheat oven to 350°F. On medium high heat, spread granulated sugar over bottom of a Dutch oven or heavy bottomed pot. Sugar will begin melting around the outer edges. Allow sugar to completely dissolve, gently stirring occasionally. Reduce heat to medium low and cook, stirring only a few times, until liquid is a rich amber color like maple syrup, about 7-10 minutes. (Don't burn the sugar.) Turn off the heat, and stir in the brown sugar and beer. The mixture will steam and may harden at this point (it will dissolve as it heats back up). Stir in the bourbon, tomato paste, vinegar, ginger, soy sauce, Sriracha, mustard, salt, pepper, and optional red pepper flakes. Stir until ingredients are combined. Place ribs in the pot and bring sauce to a boil. With tongs, turn the ribs over so that the sauce coats all parts of the ribs. 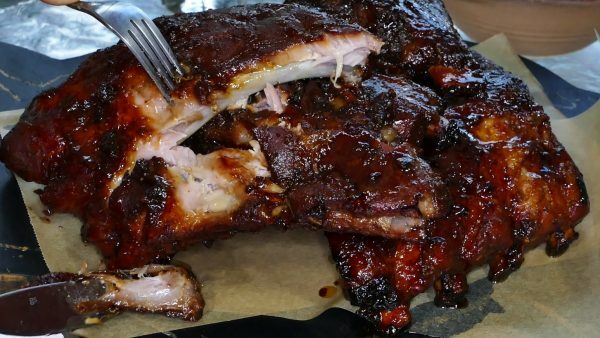 Cover the ribs, place them in the oven, and roast for about 1 ½-2 hours, basting the ribs 2-3 times during the cooking process to coat. When the ribs are tender and the internal temperature reaches 165°F, uncover, baste and allow to cook for another 30 minutes. Sauce will thicken and produce a glaze (do not let the sauce burn, as it will impart a strong, bitter taste). Brush the glaze over the ribs one final time and serve hot or warm.